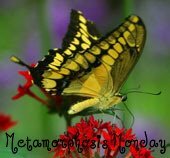 Welcome to the 310th Metamorphosis Monday! The only “Before and After” I have to share this week would most likely put you to sleep. Once the rain stopped, I spent the weekend taking down and storing away Christmas decorations. Big snore! I have something way more fun to share, a tour of this year’s beautiful HGTV dream home on Martha’s Vineyard! 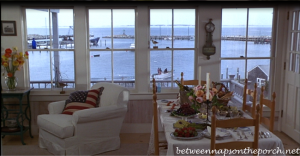 When I read it was located on Martha’s Vineyard, I knew it was going to be amazing! 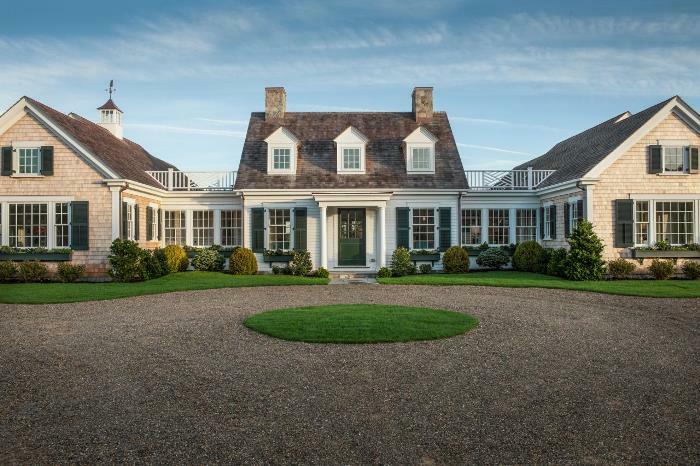 This home located at 15 Crocker Drive in Edgartown, looks as if it might be two-story, but it’s not. The three dormer windows you see across the top are part of the two-story great room. I’m not sure what’s above the wings on either side, perhaps just attic space. I’d love to see one of those as a home office…just thinking out-loud. 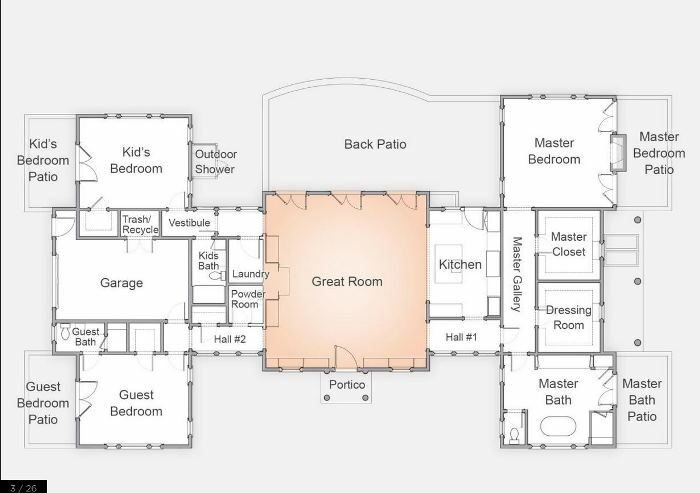 Here’s a floor plan of the home. 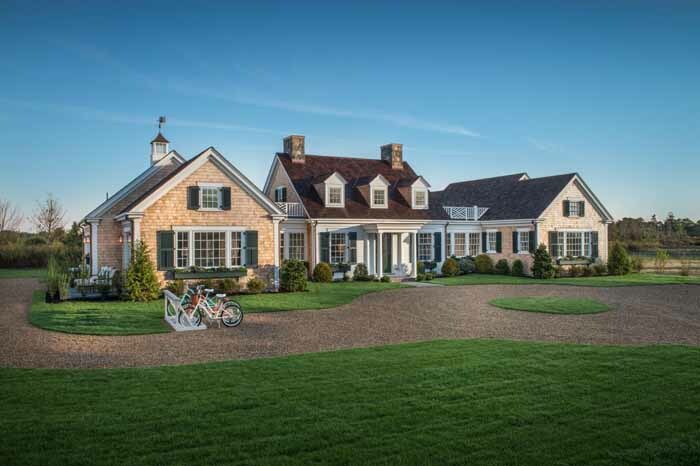 The home was built in the style of “Cape Cod Architecture.” The only two things that I’m not overly wild about in this year’s dream home is: 1. It doesn’t have a separate entry or foyer; it opens up straight into the great room. 2. It only has a 1-car garage. Do folks who live on Martha’s Vineyard normally just have one car? Maybe there’s a good reason for the one car garage. If you live on Martha’s Vineyard, help us out with that part. Are there restrictions on how many cars each household can possess on the island. Oh, the lifestyle of living on a relatively flat island. It would be great to live where one could walk out the front door and head out for a bike ride. Too hilly where I live for bike rides, unless you are really well-fit for the hills and don’t mind dodging cars right and left. 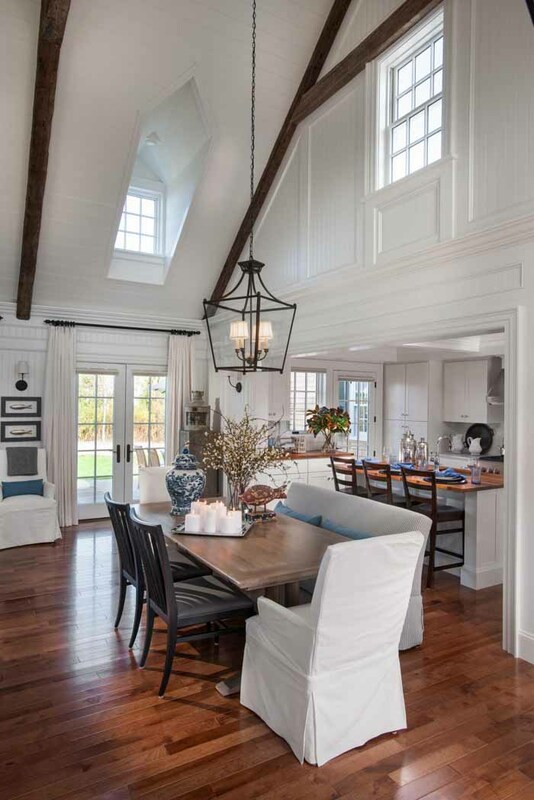 The great room has beadboard walls and a soaring ceiling with reclaimed wood beams. Notice all the wonderful built-in cabinetry. 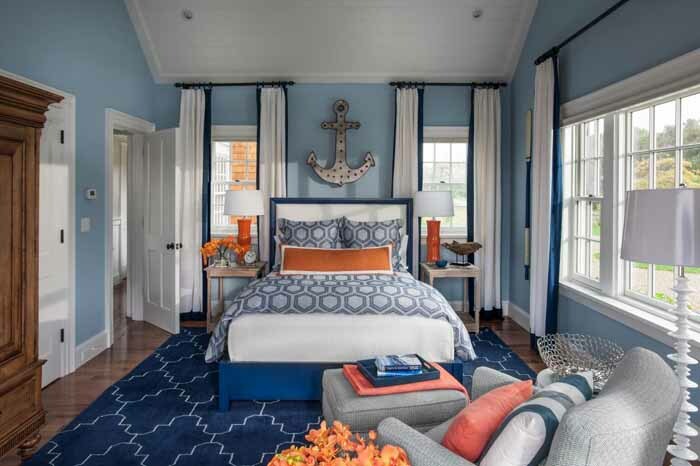 As we tour this home, you’ll notice one of the predominant colors is a beautiful, nautical blue. You’ll also be seeing a lot of rugs with graphic designs. You can see the front door and the open floor plan of the home in this view standing in the kitchen. The front door is in the center of the photo, between the two gray chests with paintings overhead. 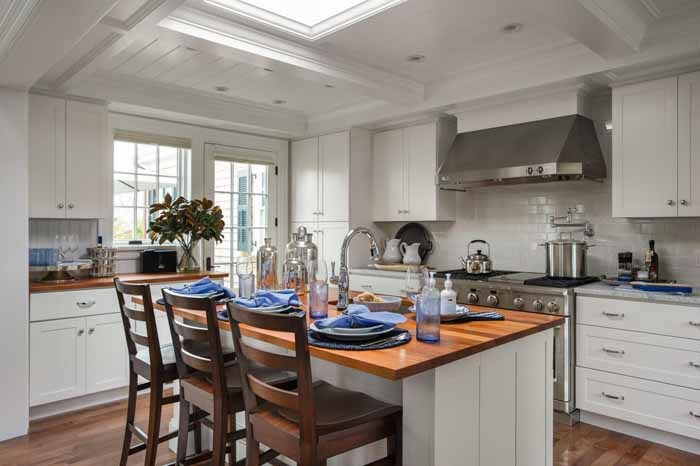 The island countertop is mahogany while the other countertops are Carrara marble. The mahogany is so beautiful contrasting against the creamy-white cabinetry. 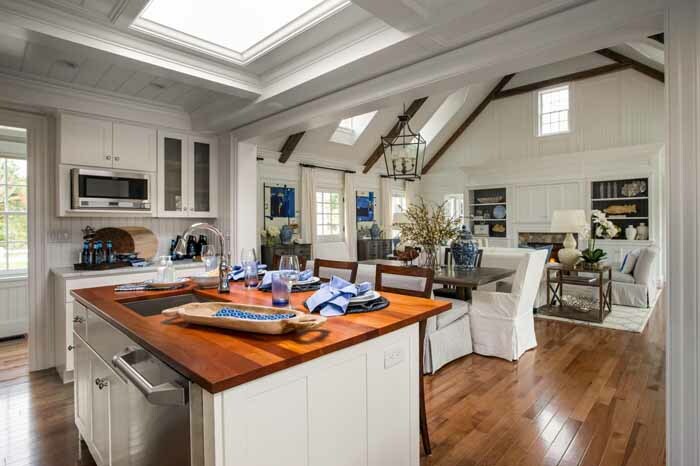 The dining area is located between the kitchen and great room…a great layout for this casual, island home. There’s a front and back hallway in the home, each one leads to the bedroom areas. Let’s go check those out! The master bedroom is a sea of blue. It looks aqua here but in the videos on the HGTV website, it doesn’t come across as aqua, just more of a soft blue. The weathered, driftwood look of the chests on either side of the bed look great with the blue. If you’re ever in doubt about what colors work together in a room, take your cues from Mother Nature. Seriously! The colors we see together in nature are normally gorgeous together inside our homes, as well. 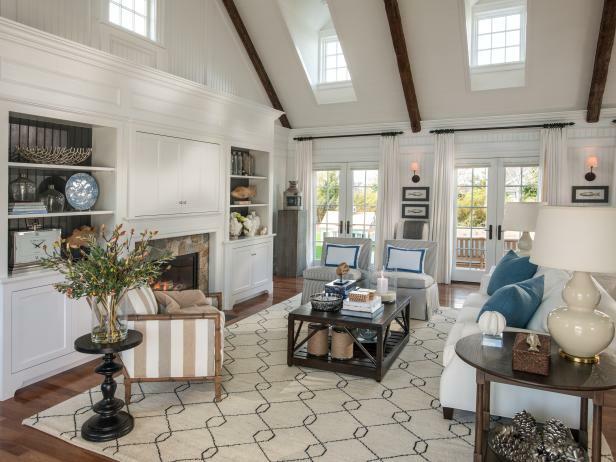 The graphic design of the quatrefoil rug really makes a statement in this room, doesn’t it? Pretty chandelier! Love a fireplace in a master bedroom! There’s also a patio off of the master. 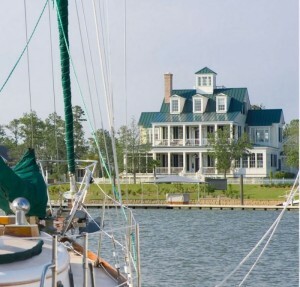 This home doesn’t have a waterside view but it looks like it does in this picture, doesn’t it. 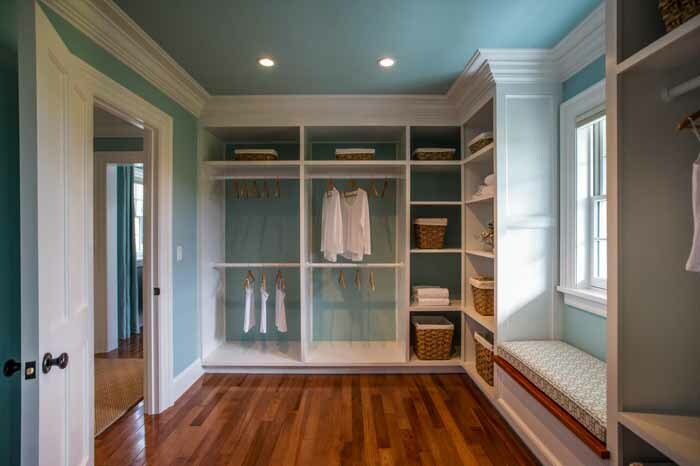 Beautiful master bedroom closet. I was just thinking, a long island in the center would add some additional drawer space to this room. Love the color of the hardwood flooring…so rich and warm! Such a beautiful master bath! Notice the pretty barrel-shaped ceiling. At first it kind of bugged me that the master bath was right on the very front of the house, then I realized, even if the bathroom was on the back of the house, there would be no way I’d take a bath with the drapes/windows open anyway. So I guess it doesn’t matter where the master bath is located in the house. What do you think? If it were on the back of the home, would you bathe with this triple window wide open as shown here? The guest room has a nautical feel with another graphic-design rug. I’m not especially loving that comforter with that rug. It’s kind of a mix of two graphic designs. They are similar but different. What do you think? 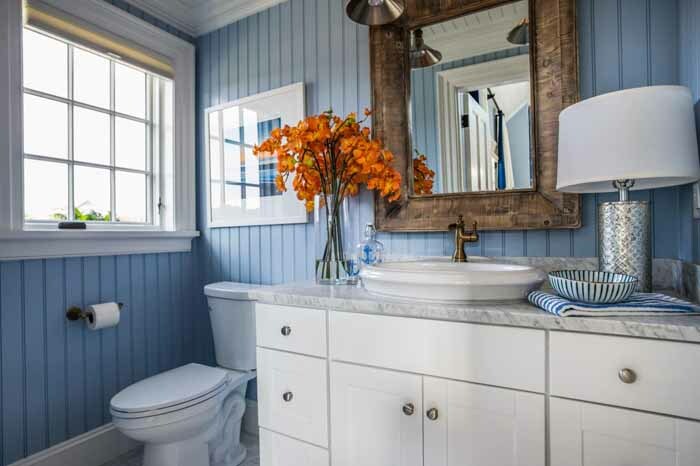 Love the blue and white beadboard walls in the guest bath! The kid’s room was a delightful surprise! Have designers finally let go of the idea that every. single. room. in a home has to “flow” into the next one. I’ve always balked at that idea (unless the rooms are open to each other) because I love too many different looks/color schemes to limit my home to one pallet. Now you know why I’m not a designer. 🙂 I love the colors in this room for a child’s room–how much fun is this! Those beds are adorable! Another great take away from this room is the placement of the beds. A room with this many windows can be intimidating for furniture placement. They made this work and I think it looks great! 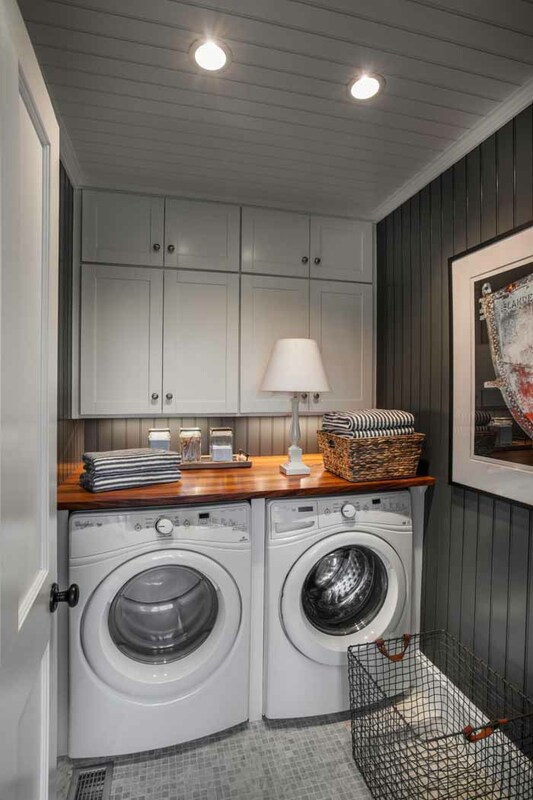 Though not very big, I really like the laundry room. I wonder if the mahogany countertop is a practical choice here? I do love how it looks! If it’s sealed well, I would imagine it would work well in this space. What say you? Here’s a question…I don’t have a front loading washing machine so not sure how this works. When you add bleach to a front loader, where do you add it? Is there a spot just inside the door? The back patio…see that area off on the right? 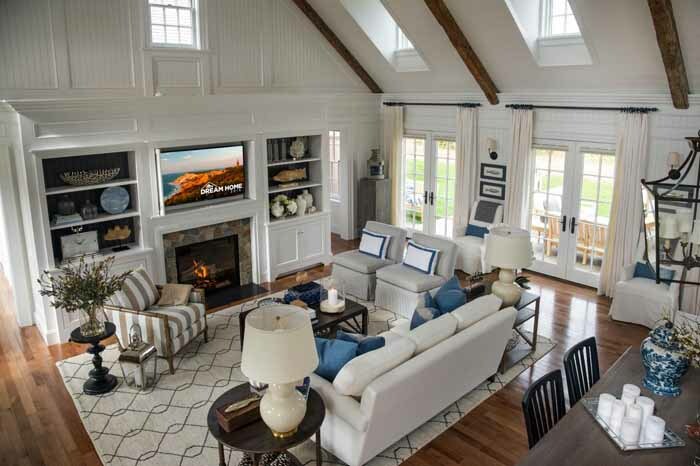 So how did you like this year’s Cape Cod inspired HGTV dream home? Pretty awesome, right?! Susan, thanks for hosting. I love the HGTV Dream Home! It’s exactly my style. In our kitchen we chose white grout for our white tile too. So far, it hasn’t been a problem, but we’re empty nesters now. Not sure if I would have thought it was a good idea when the kids were younger. Jann, I was thinking white grout might be okay for us empty nesters too, although I have been known to sling stuff out of my mixer when mixing up cakes and such. lol They do make sealants, though…so that would give us peace of mind. Fantastic house. 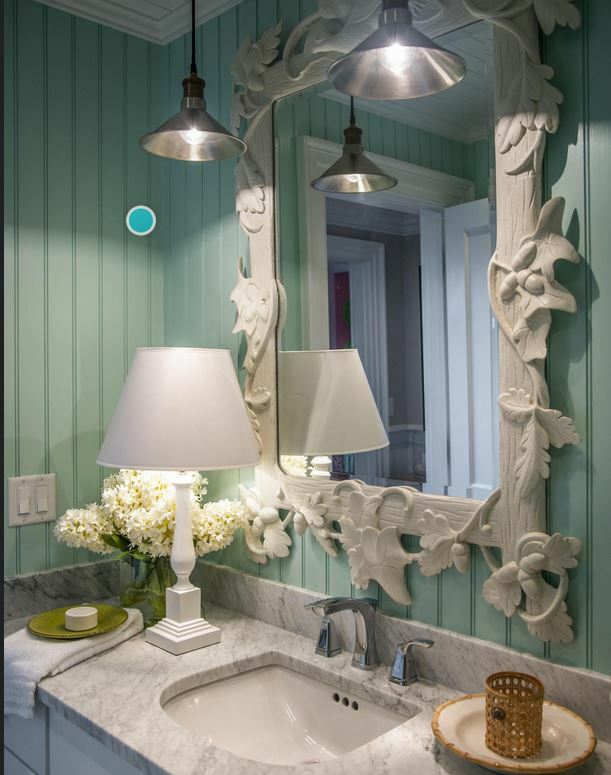 I am not usually a “blue” girl, but something about these rooms speak to me…and yes, great mirror!! 🙂 Thanks for sharing and for another great party, Susan. Happy 2015! Thanks for sharing the tour and the weekly link-up. Happy New Year! Julie, we solved the mystery of the one car garage. Apparently, it’s hard to get car on/off the island (has to go by ferry) and most folks walk or use mopeds, bikes and the local buses to get around. I bet they don’t have near all the wrecks and collisions you see here in Atlanta. That would be so nice! Wondering how the house would be in the Winter with all the large windows. I’d want to live there yearround. Good question. Hopefully they are insulated well because that area can certainly get cold. Overall, this house is great, but window and door placements are truly odd! That front door is dressed like a window! and the full frontal view in the bath?! I’m not even sure kids would be comfortable in such an open room – so many windows for monsters to climb through! In front loaders, there’s a little drawer on the far left side – that’s where the detergent & bleach go. Thanks for the party and tour – always a fun start to the week! I noticed that about the door. I guess they were trying to balance the look with the nearby windows, although I’m not sure why. Oh, and thanks for sharing about the drawer on the washer, Rita. I think I see it in the picture now that you mention it. That house is amazing! My husband and I were watching HGTV when they shared the tour the other night.And yes we are trying to win it…what a dream <3 Thanks for hosting! Hope you had a wonderful Christmas and best wishes to you and your family in 2015! I hadn’t had a chance to see pictures of the Dream House, so I was thrilled to find them at MM. I’m filing away lots of ideas! The master bath has the same layout as the ranchburger’s, and now I have a “master” plan for that space. The dog house is adorable! Thanks for hosting another great MM! Lovely, lovely, lovely. In answer to your front-load question, if you look closely you will see a slot on the left hand side. Probably the hand pull that slides out to allow you to put in your detergent and bleach. Generally, the bleach slot isn’t activated until you are already into your wash cycle. I’ve had a front load for 14 years and I feel it does a much better job, not to mention the water-saving benefits. I generally mix my bleach/soap/water and pour into the detergent slot once the water is in and the clothes have started agitating. Yep, I see that now…so that’s where it goes! Thanks, Linda! Do you ever have any mildew issues around the door? My sister bought two beautiful front loading machines and her’s tended to do that unless she left the door cracked. Hopefully they don’t all do that. Susan, there is a product that takes care of any “funkiness” that allows you to keep the door closed. I love my front load washer, but wasn’t thrilled with the smell after a few months of use. I bought a product called Affresh (buy mine at Walmart). You simply throw one of the large tablets into the empty washer and either run it on normal cycle using hot water or use the special cleaning cycle if your washer has that option once a month. (Mine is an LG and has “Tub Clean” option.) The directions are on the back of the package. It took care of that problem. Oh my gosh, Susan! That’s hilarious. I have never heard of a washing machine lasting that long. That’s awesome. You certainly got your money’s worth out of it! It’s older than Chip! Ha! Yep, it is…got Chip beat by 4 years. The first year after we were married, we were living in married student housing and they didn’t have hookups for a washer/dryer, but after we graduated and moved, we bought a GE washer/dryer set. I’m on my third dryer…haven’t been as lucky with those. But the washer is still going and still works great. I wonder how long new ones last these days. P.S. Thanks for hosting Susan! Beautiful home, but some what impractical because of all the large windows in the bathroom. Who wants moldy or wet drapes after numerous baths and showers? I think tubs in front of a window are silly. Again, too much white in the main living areas, but very nicely done, as well as the bedrooms. At least there is some color. Ethan Allen did the designing and furniture if I am not mistaken. I would agree with you. Many windows, no matter how efficient means lots of heat loss in a cold climate. And cathedral ceilings in a home means lots of wasted heat sitting where no one sits–up above you. They are also very difficult to maintain unless you want to hire a guy with a scaffold to paint it for you. Removing cob webs requires huge poles. It looks pretty but is not a practical design for the area. Real Cape homes utilize that upper area as living space. Susan ~ It really is a pretty home but….I honestly can’t tell it apart from all the other white interiors with wood floors homes. Why is it only blue can be used? Thank you for hosting, Susan. I think this year’s HGTV house was their best one yet. Love it! What a gorgeous home. Thanks for sharing. I got a lot of ideas and inspiration from this house. Thanks so much for the party Susan – and the Happiest of New Year’s to you and yours ! Since you appear to know this area well, what would you guess the property taxes would be on this home? I’m thinking they’d likely be 12k – 15k per year but I really don’t know. Thanks! Hi Pam – I actually researched the property taxes for my blogpost on the house last week and was shocked that they are actually quite low. 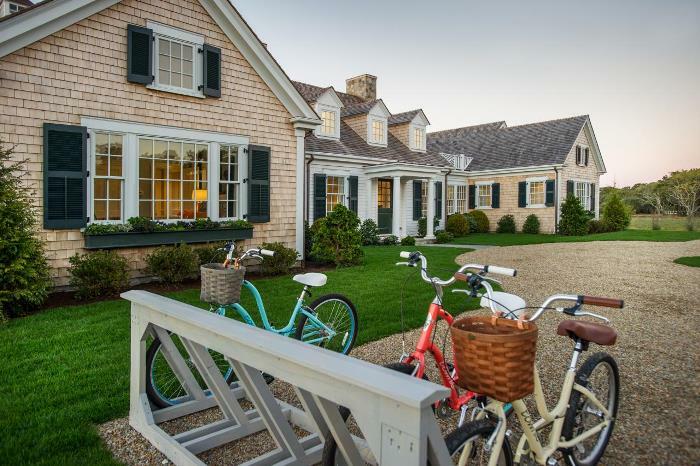 For Edgartown, which is where this house it, they are $3.70 per thousand. So, if the house has a value of $1 Million, it’s only about $3,700. By contrast, my little town’s taxes are $16.68 per thousand. Part of the reason is that across the board, the individuals property values are extremely high on the Island (no surprise there), with a low full-time population of only 18,000 that swells to 180,000 in summer months. So, the tax base is high, therefor the rate doesn’t need to be. A real “win” for those living full-time in smaller properties – which is good because the full time residents aren’t the wealthy one’s. Thanks, Linda. That actually does sound like a bargain for Massachusetts in general and for Martha’s Vineyard, in particular. I like the house a little better now. 😛 I believe I’d love to live there year round. I miss the snow (I’m originally from Brookline, next to Boston) and I love islands and always expected to live on one. I envy you! I have only been to Nantucket, but I know Martha’s Vineyard is supposed to be very much like it. Say .. you don’t run a bed and breakfast by any chance? 😀 Lol. I was wondering the that vaulted barrel ceiling in the master bath was too high to allow for a room above. That makes sense. I think I’d rather have the room than the high ceiling in the bath. I agree…three bedrooms is so small for a home located in a popular vacation spot. Wow, that is a huge influx of folks! Amazing…had no idea the population increased like that. Thanks for clearing up the mystery about the one car garage. I think it would be wonderful to live where you could walk or bike to most places. If they allow golf carts, that would be a great way to go to the grocery store because you would have somewhere to put the groceries. I guess most folks would use their car for that trip, though. Martha’s Vinyard restricts vehicles on the island. Only residents are allowed to bring vehicles onto the island which is only accessible by a ferry boat. When I visited with a friend, we parked her car in a parking lot at the ferry, took the ferry boat to the island and then did all of our travelling around the island on one of the island buses that take visitors and residents between the 3 towns on the island. You can also rent a bicycle or moped to toodle around the island. I do not know if there is a 1 car restriction, but I do know that many of the residents do not use their cars to travel to the shops and such but ride bicycles. You will note in the first picture of the house, that the bicycle rack is right out front. Gas on the Vinyard was almost triple what I was paying for gas when I was there so I would think that would also make running around in your car more restrictive. They are also very “pollutent” conscious. I love this house. Really wonderful. I actually watched the HGTV show about this house over the weekend, but didn’t really catch all the details. I am going to go back and pour over your photos, the whole place is just dreamy…love the floor plan and the master suite is to die for! 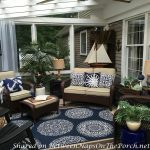 Thanks for sharing and hosting this fun Monday party Susan! Thanks for hosting! 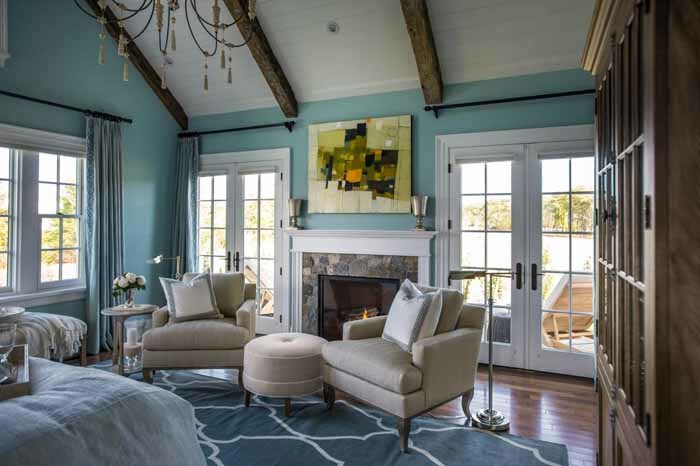 I just adore the master bedroom and bath and the other blue/aqua bath. They are so inviting and make your feel like a vacation! Too much wasted space for me and too many windows. I really don’t like living in a fish bowl. Now, is this a year round home or just summer?? There is no basement nor furnace, how about air conditioning?? I understand the one car garage after reading the above comments. Is there a maintenance shed?? Don’t like the main entry into the great room. And the large windows on either side of the entry face into hallways……what’s with that?? Love the use of blue and the beautiful wood. Thanks Susan, you always bring the interesting ones to us!!! On the HGTV website there are tons of photos and in those you can see the bulk head access to the basement outside the master bedroom suite. I doubt it’s a full basement – probably only under that wing – enough for the machinery of the house and some storage. There are also a/c units there as well. So, it definitely is a heated house. A/C isn’t all that necessary on M.V. because of sea breezes, but it’s common to include it in a new home. The house is absolutely lovely on pictures, but doesn’t seem very practical on a day-to-day basis… Doesn’t seem to be the point anyway! It’s a beautiful home with light filled rooms. It doesn’t seem to have any immediate neighbours so there would be privacy. I could move right in and be very happy. I don’t think there is anything wrong with decorating in a different style/colour in a bedroom. They don’t open directly onto the main living spaces. I love the red in the kids room and the placement of the beds. The pergola makes another room in the backyard. And, that dog house. Cute! I’ll take it! It’s a pretty house, I love the vaulted great room and the paint colors. Not found of the boxy upper kitchen cabinets. This house segregates the family too much for me. Everyone has outside access and you can’t get from bedroom 1 to bedroom 2 unless you run through the main living room. I like the kids on the other side of the house, but not so separated. I’d move the entry to the hallway, and I’d lighten up on the wall to wall windows in the bedrooms, too. I love the looks of the house, the decorating, etc. However there are some things on the floor plan that concerned me. 1. Too many doors to the outside, 10 of them, I would never feel safe. 2. When the door to the vestibule in the children’s hall is open one cannot get into the children’s bathroom. 3. The outside shower area does not match the floor plan. I love that you share these homes with us. I keep what I like for future use and learn from what I don’t care for! Patti, that’s what I love to do…I love getting ideas and using the ones that fit. Wow, that’s a lot of doors…didn’t realize there were so many! I would love to know the crime stats on Martha’s Vineyard…I have a feeling they are pretty low which would be wonderful. Pretty amazing house to win! Not a perfect design but beautiful and a great location to live part of the year. Thanks for sharing, Susan! Entering every day like all the past homes. I’m so glad you shared this today. I saw the show when it aired the other night, but seeing it in pictures gives me a chance to really look at the details. They did a beautiful job. 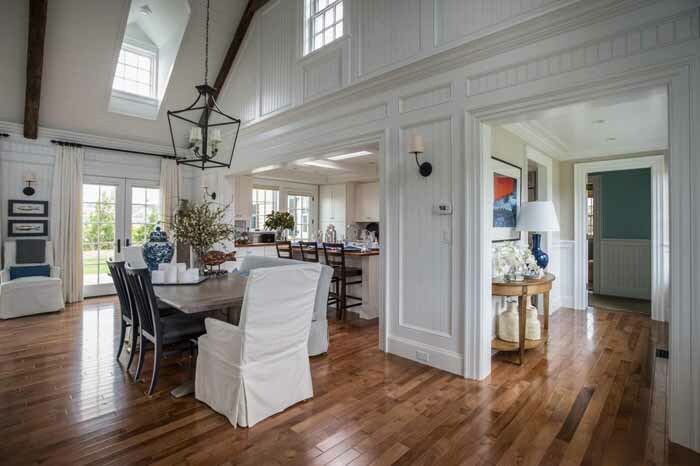 I am fond of beadboard, so the use of it makes the décor even more appealing to me. I don’t think I’ve ever seen a master wing before! Wow… It is lovely. I agree with you about the need for some privacy when bathing. And, for my taste, I would want a shade tree or two near the house, but that’s just me. I enjoyed the tour! Thanks, Susan!! Well I guess I am in the minority. I don’t care for this house at all. Maybe I am too practical but as for a “real” home to live in it just doesn’t seem realistic to me. Thank you for hosting the link up! I *love* the HGTV home this year – by far their best one yet! Awesome post! What a fabulous home…..and the doghouse, so clever! Thank you for hosting and sharing! Well Susan, you had me after the words Martha’s Vineyard!! 🙂 I love the soaring ceilings (my last home had that), the windows and all the built in cupboards. The moldings are splendid. I was looking at the bathroom, and thought I saw a blind at the top of the window. One thing I was wondering about was, why do they have an outdoor shower, if they are not near water? Did I miss the pool? This is a definite addition to our list, I am hopping over to the site now. I wondered if that was a blind. What would be perfect in these houses that have big windows in the bathroom is the blinds that work by remote…you know the kind where you just press a button and it lowers. I wouldn’t mind the windows at all with that kind of treatment. I wondered about that too. It sounds like when you’re on the island, you can get to the beach very quickly by bike or even on foot…so maybe it’s just there to rinse off after a day at the beach. Imagine biking to the beach, spending the day there, having a picnic and biking back. Sounds like a dream! 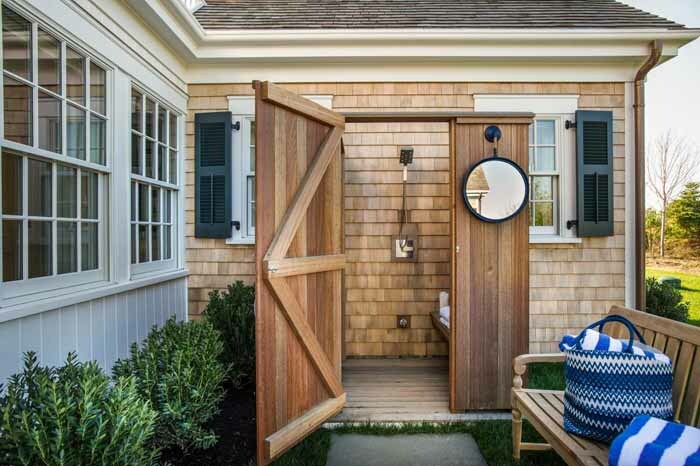 No one on Martha’s vineyard is that far from a beach so that would be why you’d have an outdoor shower. I’ve never been there. However I could stay there for a vacation. It’s gorgeous. Thanks for hosting. I watched this on HGTV and kept pausing to take it all in. THANK YOU for providing this post…much better! I’d take that house IMMEDIATELY and then maybe change just a few things, but, c’mon, let’s be honest, it would be a FANTASTIC gift, anyway! Fantastic house ! However I would need more bedrooms for all my friends to visit when I win the house. Ha! sure would have plenty of room in that house, who needs a couple cars when you have that to roam around in. Thanks for sharing and hosting. I watched the HGTV special too, and overall I’d love to win it. But I’d change a few things. I dislike that style of bathtub in the master bath, because it doesn’t look as if it’s easy to get in and out. There’s nowhere to put shampoo or soap except the window which is quite a reach, and messy. And there’s no place for a handy towel when you get out. I’d change that right away. Also thought there was wasted space everywhere. And I’ve heard that marble countertops are not ideal – I’d choose something else, and maybe have only a small spot for making pastry. But I’d love to live so close to the ocean, even in the winter. I’ve lived by the Atlantic and it’s breathtaking! Hope you had a great holiday and many thanks for hosting. Thanks for the party Susan and the tour of the HGTV Dream Home. It is a beautiful home. Susan you picked my absolute favorite spot in the world! 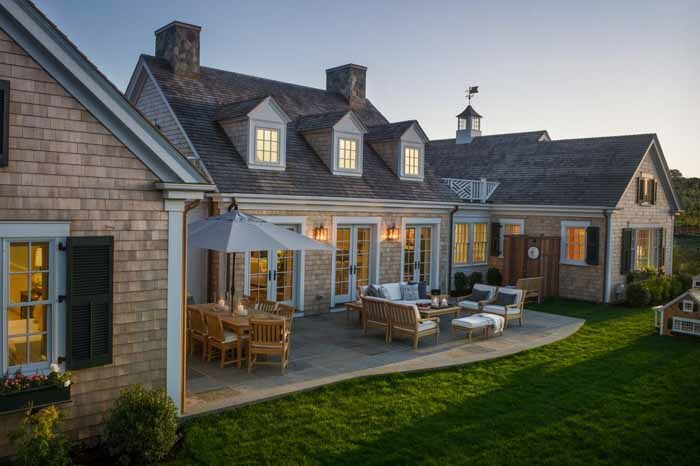 There is just nothing quite like Martha’s Vineyard and this house is gorgeous in every way. Right you are on the cars, most people do get around by bike or moped. I did bike the entire perimeter of the island in my younger years and other than one hilly area on the less populated side of the island, it’s actually a relatively easy, not to mention beautiful, ride. Getting your car on and off the ferry is a little inconvenient and for the most part unnecessary. For those visiting, bike and moped rentals are readily available immediately off the ferry. can anyone tell me if there is great sea shelling there.. I couldn’t want to live there if there wasn’t. We just came back from Myrtle Beach and that isn’t a place to go sea shelling. We have been to Topsail N.C. and it is great.. love that place. Lots of nice houses to rent on the outbank area. thanks to anyone who can tell me about the sea shell hunting. Robin, I’m not sure about Martha’s Vineyard but both Captiva and Sanibel Islands are amazing! I haven’t been there in many years but when I was last there, the beach was covered in shells. There were so many, it was hard to walk barefoot. Someone told me folks go there to collect them to make jewelry…not sure how accurate that is, that’s just what I heard. Thanks for hosting the party and for sharing the Dream House. So aptly named. I could move in tonight. This truly is the dream home! Everything looks awesome! Thanks! If the island stools were being used, there is no walkroom between them and the dining room bench (love the fabric on the bench). It would be nice to have working storage in the area above the living room fireplace. The chandelier in the dining room is almost as large as the table and looks like it might have been intended as an outdoor front entrance light. Do you like three different types of seating at the dining room table — bench, chairs, covered chairs? Again there is the question of space in the master bedroom. When the French doors are open, there would be no walking space. Absolutely need an island in the master closet! Very little storage. 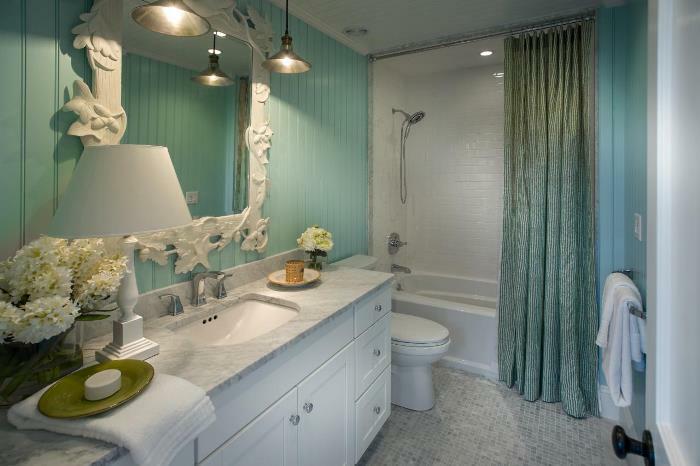 Although the colors in the master bath are entrancing, there is way too much wasted space. Perhaps a dressing table in the sink wall? I agree that the tub would be drafty and unpractical. Done for the Wow factor, I suppose. Fewer windows would allow for a stool or other place for necessary bathing items. Agree that the bedcover in the guest bedroom should be solid; and the anchor above the bed would give me nightmares of being crushed while asleep! 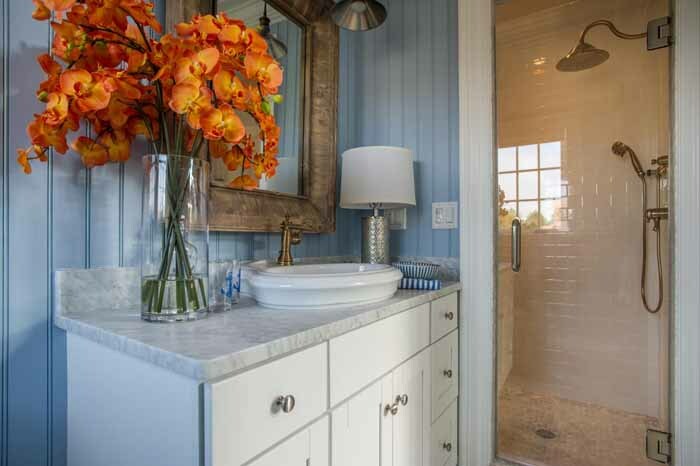 Love the beadboard and subway tiles in the guest bath and love the rest of the house. 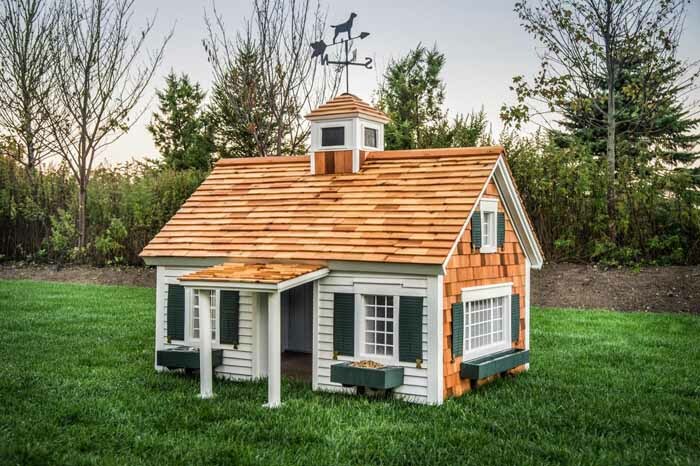 The doghouse is wonderful, but could it not better be appreciated if, with slight modifications, it were transformed into a playhouse? I have always dreamt of such an area! Thanks for the tour. I would have missed the sweepstakes without it (no television). I look forward to your next tour. Hope it has some more soothing blues! Its a great layout, I do like the separated bedrooms–much more private. Another bedroom would be great for larger groups, but could add a bunk bed in the Children’s room (or elsewhere). I love front loading washers–less water, less wear&tear on clothing, more stain removal. But I am dying to know the ADDRESS. I travel to the Cape every year, and very curious to know where it is on Martha’s Vineyard. Please tell! Linda, it’s located in Edgartown, I believe on Crocker Drive.